society for roots and trees joined forces with the curators of Three Rooms Press for Maintenant 6 – a Journal of Contemporary Dada Writing & Art. Moment is now, and dada of now is the most exciting dada anywhere. Maintenant 6 is a tour de force of collective beauty, protest, and intellectual cathartic catalyst. We want to show you multiple images and poems from it, but excerpting takes away from the continuum. This journal is something best experienced as a whole work – we cannot take a piece of the liver to represent the entire woman. Like Jack Spicer’s poems, everything within Maintenant 6 resonates and converses with the other pieces, as well as with the reader. The resplendent artist and poet Mina Loy was there at the beginning. 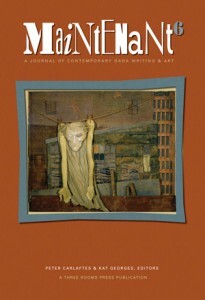 Mina Loy is still here; her painting, “Christ on a Clothesline” is on the cover of Maintenant 6. It’s how we feel, wrung out and martyred. Mother nature cut up on a luncheon plate. We are continuing with the original dada intent of protesting colonialist interests and war, which now translates to protesting corporate interests and war. We are continuing with the dada intent of reflecting a manipulated society thru art collage and found poem, taking the broken pieces of this life and reclaiming them as something magnificent and true. Dadaists like to use manifestos for new societies such as ours, where the universe is our communal heart. The theme of Maintenant 6 is declaring art on war. That’s what we do. We protest violence in our kindness. We use our energy towards creativity and love, not for making bombs. We are all feeling the same right now. We are remixing our feelings of outrage against so much genocide, suicide and emptiness of toxic plastic. One of us exhales a distressed sigh, and the next inhales that breath to bring magic to the lungs of the polluted, releasing a cry for justice. There is immediacy in Dadaism; all poems in Maintenant 6 are 20 lines or less, making space for 120 artists to live in 120 pages. All the art within is provocative, protective music. There are few words used because there is little time to live. Maintenant 6 is the journal that the deer would make if they had access to a press. It transmits the psychic rhythm of underground rivers. It’s a post-rock artscape of societies’ ancient wisdom and technological transcendence, containing much word play, pieces of meadow flower, elevator door, graffitied alleyway and digital consumption, blended into a potion of inventive pacifism. Become a part of the dadaist revolution here and now. next years Maintenant 7. Thanks! 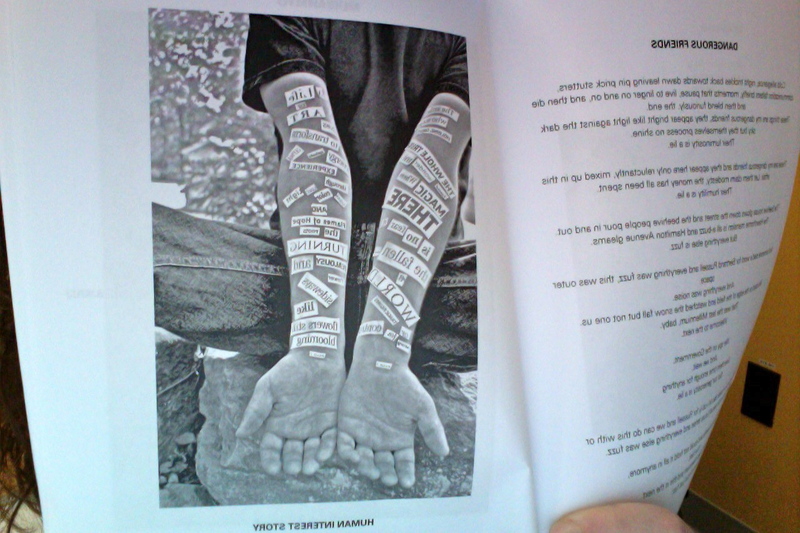 and hey, that is my poem in the picture…the one on the other page…that can barely be seen but there it is, so yay! yay. glad to read review. glad to be part of 6. was feeling grubby in the gutter. DADA Bravo! Bravo DADA! Glad to see it’s getting some well-deserved attention! Kudos to Kat Georges and Peter Carlaftes for putting this beautiful book together. And I’m not just saying that cuz I’m in it. Honored to be amongst so many friends and terrific poets and artists and curs. Of curs. Reblogged this on Key of Z.